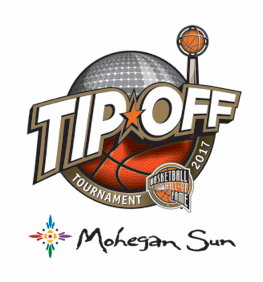 Naismith Memorial Basketball Hall of Fame Announces 2017 Tip-Off Tournament Schedule — Position Sports, Inc.
SPRINGFIELD, MA – The Naismith Memorial Basketball Hall of Fame announced today the field of teams and brackets for the 2017 Tip-Off Tournament. The annual NCAA men’s exempt tournament sponsored by the Metro Atlantic Athletic Conference will take place Saturday, November 18 and Sunday, November 19 at Mohegan Sun Arena in Uncasville, Connecticut. Eight schools will compete in two four-team brackets with campus round games leading up to the Mohegan Sun Arena contests. Teams scheduled to participate in this year’s Tip-Off Tournament are: Boston College (Atlantic Coast Conference), La Salle University (Atlantic 10), University of Maine (America East), Northwestern University (Big Ten), Sacred Heart University (Northeast), Saint Peter’s University (Metro Atlantic Athletic Conference), University of South Alabama (Sun Belt) and Texas Tech University (Big 12). The Metro Atlantic Athletic Conference will continue to serve as the host conference for the annual event. The MAAC has developed a strong partnership with the Basketball Hall of Fame, including the addition of a MAAC exhibit in the Hall of Fame museum in Springfield, Massachusetts. General public tickets will go on sale Friday, September 8 at 10am ET via all Ticketmaster outlets and the Mohegan Sun Arena box office. Pre-sales for participating schools begin Thursday, June 1. Broadcast information and game times will be announced at later date. For more information, please visit www.halloffametipoff.com. Mohegan Sun Arena is now ranked consistently among the top venues in the world according to Billboard Magazine, Pollstar and Venues Today. It has won “Casino of The Year” at the Country Music Awards in 2008 & 2010 and in 2013, was voted “Arena Of The Year” at the G2E Global Gaming Conference in Las Vegas. Mohegan Sun Arena was also ranked among the top 10 arena venues in the nation for 2014, regardless of size. In 2015, Mohegan Sun took home the IEBA award for “Casino of the Year.” Mohegan Sun also won “Casino of the Year” in 2 categories at the 2013 & 2016 Academy of Country Music Awards. For more information on concerts and other great events, visit Mohegan Sun. For information on this week’s schedule, call the Entertainment and Special Events hotline at ‪1-888.226-7711, ext. 27163. The MAAC, headquartered in Edison, N.J., consists of 11 member institutions: Canisius College, Fairfield University, Iona College, Manhattan College, Marist College, Monmouth University, Niagara University, Quinnipiac University, Rider University, Saint Peter's University and Siena College. For more on the conference, please visit www.maacsports.com.